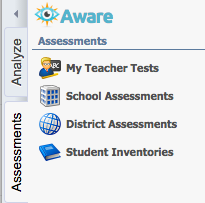 On the Aware Assessments tab, users can create, view, and manage assessments. Assessments created by teachers who have no roles and rights will appear under My Teacher Tests and are visible only to the user who created them. School Assessments - assessments created by users with the campus-level user role "Campus Administrator"
District Assessments - assessments created by users with the district-level user role "District Data Viewer"
Student Inventories can also be managed by district-level users. District-level Aware managers can manage their local test types with added functionality. They are able to designate whether a test type is a School Assessment or a District Assessment. Team Assessments can be added and can have their own test types.